Do you ardently desire to move your fish and aquarium with you on your move to or from Cedar Rapid? Are you having a hard time thinking of how to do this while ensuring your fish will have higher chances of surviving? This is very challenging task, even for movers. But here are some tips you may wish to consider to give you higher chances of successfully doing it. It is best not to feed fish two days prior to the move. When you need to move, net your fish and place these in individual bags, just like the ones in pet store, with aquarium water. To ensure you get the right type of bag, you may want to buy it from one of these stores. However, if you’ll be travelling for more than 6 hours, then it is better to add pure oxygen into these bags as supplied by your local fish store. Call in advance for them to prepare this for you. To keep maintain the temperature of the water, place the sealed bags of your plants and fish inside a sealed cooler. You may think that draining all of the water inside your aquarium to be a wise thing. However, that is not a wise thing to do. Rather, experts recommend saving water from your aquarium into buckets, including the gravel. Use 5-gallon of buckets with lids to keep this water. This will help reduce the time of restarting the system inside your aquarium while decreasing any risk of toxic ammonia spike that can is harmful to your fish. As for your pumps, heaters and other aquarium accessories and equipment, it is great to pack them just like any fragile appliances. Use the appropriate boxes to protect it and prevent it from breaking. However, for your filter media and sponges, it is best to keep these immersed in some of your aquarium water. This helps minimize the sudden disruption of bacteria colonies in it while reducing cycling time. But I am moving for more than 6 hours, what shall I do? In cases like this, it is better to take the gravel and put some water to it. As for your filter media, it’s better to clean and discard it to ensure it functions efficiently in its destination. After arriving at your destination, place the water you’ve stored at the bucket back into the aquarium. As needed, add fresh water or premixed saltwater to get your heaters, filters and other aquarium accessories running. Let the temperature of the water acclimatize before adding in your fishes. 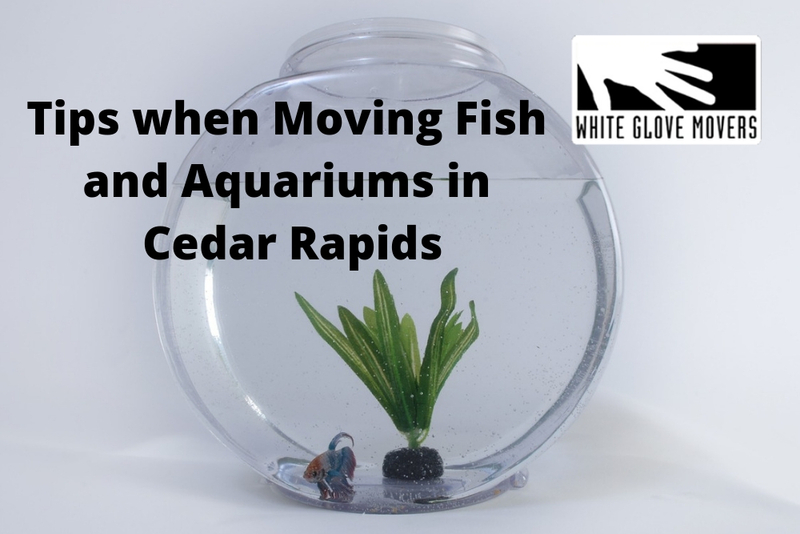 Hope this moving fish and aquarium to and from Cedar Rapids helps you. Continue following our blog to receive more updates and tips when moving.